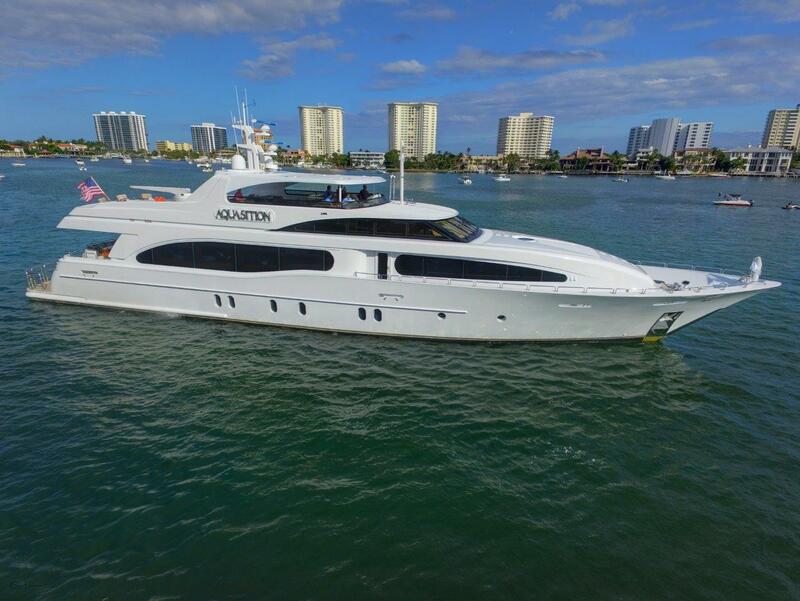 RJC Yacht Sales is pleased to announce the Sale of the 124' Broward, AQUASITION! This yacht represented the newest, customized Broward Motoryachts built to ABS class! Her custom interior was designed by Evan Marshall to include her joinery done by Genesis of Viareggio Italy. In January 2017, she received new furnishings and carpet along with custom window treatments, overhead panels and soft goods throughout by Architectural Interiors. She accommodates (10) owner’s and guests in a (5) stateroom layout with an on-deck Master, King VIP, (2) Queens and a twin stateroom along with (6) crew below. Her main deck features a large main salon and dining area, gourmet galley and large aft deck with dining for (10). Her spacious flybridge features a new custom Pipewelders hardtop, new Jacuzzi and granite surfaces throughout the flybridge in 2017 along with wet bar and BBQ grill. New Spark Sea Doo’s are housed below deck at swim platform. Equipped with all the large yacht options to include twin Kohler 65KW generators, Naiad stabilizers, bow thruster, 1800 GPD watermaker, Asea power convertor, plus much more! All of this in addition to the complete exterior hull paint in 2014, this vessel is truly in ‘as new‘ condition! Her asking price was $6,495,000. and the vessel will be based out of South FLorida.